Japanese Episode AG 106: "Koi suru Kuchiito! Hasuburero no Hana Michi!!" American Episode 377: "Once in a Mawile"
As our heroes continue to make their way through Izabe Island, Satoshi decides to have a practice battle with Takeshi. Satoshi's Cortoise sends Takeshi's Hasubrero flying through the air after a powerful attack, so Takeshi and the others are forced to stop the battle to run after it. When they find the water pokemon, they also come across a ribbon dancer named Sayori. Sayori's pokemon, a Kucheat, seems to have fallen for Hasubrero, but Takeshi's pokemon doesn't seem to want anything to do with it! 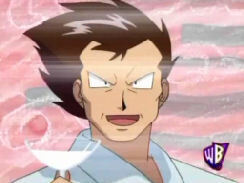 As Takeshi tries to coach his pokemon in the ways of love, the Rocket-Dan appear and attempt to steal the Kucheat. They fail, of course, but that doesn't stop them from attempting a second kidnapping during a stage show that Sayori is participating in. 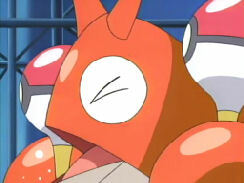 However, instead of stealing Kucheat, they accidentally kidnap Takeshi's pokemon instead! Satoshi and the others go after them, and before long they defeat the Rocket-Dan and enable Sayori to resume her ribbon dance performance! As Sayori dances, Hasubrero starts going through Sayori's bag and pulls out a Water Stone! As everyone else watches on, Takeshi's Hasubrero evolves into Runpappa! However, now that it's evolved, Kucheat doesn't want anything to do with it! Despite this disappointing news, Takeshi's pokemon is able to dance the night away. Well, after last week's completely off-the-wall episode, we get another episode that tries to offer the same sort of zaniness. Unfortunately, this one just doesn't seem to have as much focus as the Nendoll episode. While I do enjoy random comedy (I love Bobobo-bo Bo-bobo, for example), this episode just didn't really do it for me. The Heigani subplot just sort of seemed tacked on for no reason, and the scene with Sonansu and Hasubrero talking to each other was lame and dragged on for way too long. 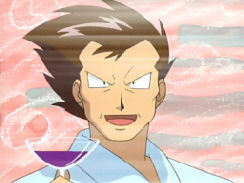 Plus, Takeshi's pokemon evolving was so obvious it wasn't even funny. On the dub side of things, this is the third episode in a row with some sort of digital paint edit, but other than that it's nothing terribly special. The Japanese version used a lot more of the old Kanto music than the English version does, and while it does make a difference in the feel of some of the scenes, it's nothing that hasn't happened in dozens of episodes before. ~Pokémon Symphonic Medley~ replaces The Challenger!! as the opening theme as of this episode in Japan. We also get some new eyecatchers to go with them; Kyogre and Groudon are replaced by Rayquaza and, later, the three Regis. Finally, Orchid-Hakase's Pokemon Lecture, a segment which has been going on since mid-Kanto (though nobody can seem to figure out when it started exactly) has been replaced, as of this episode, with a segment called "Pokemon Trivia Quiz." A second is trimmed from the first shot of the episode. Another second is trimmed from the shot right before the opening theme. And two seconds are trimmed from the episode's title screen. Sakaki's wine is changed into a milk-like liquid. A second is trimmed from the shot of the city after the Trainer's Choice commercial break. As soon as Hasubrero runs over from the Rocket-Dan's side to Satoshi-tachi's side, the fifth opening theme to the original Pocket Monsters series, Ready Go!, starts playing in the Japanese version. In the English version, this is replaced by various pieces of instrumental background music. I actually don't mind this change since I think the Japanese version uses Ready Go! as an insert song WAY too often. May: "Look! 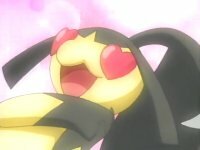 Now Mawile is really in love with Lombre after that!" 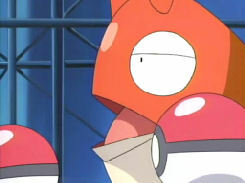 Max: "Corphish might as well forget it now!" There's a one-second shot of Heigani, on-stage with Takeshi, sneezing. After that, the battle resumes. You see, in Japan, there's a belief that whenever you talk badly about someone, the person you're talking about sneezes. In Heigani's case, Masato is talking about it behind its back, so it sneezes. My guess would have been that 4Kids cut this out because it was "too Japanese" and felt that American audiences wouldn't get the joke. But the fact that they left in the Sonansu / Hasubrero exchange, which is based on a Japanese comedy routine that only Japanese people would get (PokeAni says it's based on a routine by Yokoyama Yasushi and Nishikawa Kiyoshi) tells me that it was cut because they thought it was too random to interrupt the battle with. Finally, a second is cut from the TO BE CONTINUED... screen.